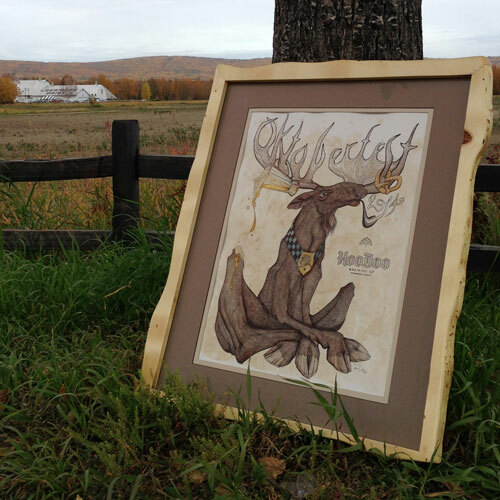 To commemorate Oktoberfest 2014, we commissioned an original piece of art by the amazing Brianna Reagan and we’ve partnered with our friends at FairbanksAlaska.com to auction the stunning watercolor for a great cause, Friends of Creamer’s Field! Friends of Creamer’s Field is a local nonprofit organization dedicated to preserving the 2,000-acre dairy-farm-turned-wildlife-refuge that surrounds the Alaska Department of Fish and Game offices on College Road. Local craftsman Scott Houghton of 30 Below Woodworks created a frame for Brianna’s work from the 80-year-old spruce tree that was cut down in October at Creamer’s after it was determined that the tree was infested with spruce bark beetles. The original tree was planted next to the farmhouse in the early 1930s by former owners Charlie and Anna Creamer, who owned the farm before it was sold to the state and turned into a refuge in the early 1970s. The tree served as a sort of community Christmas tree for 15 years and the tree-lighting ceremony was an annual tradition at Creamer’s Field. This is a one-of-a-kind piece with a lot of character, and history. More details can be found on the auction page and FairbanksAlaska.com. Original artwork measures 19″x24″. Pen & Ink & watercolor on Bristol. The frame is historic white spruce from Creamer’s Field. Bidding will begin at the start of Oktoberfest, Saturday Sept. 20 at noon and will finish on October 5 at midnight, at the close of Oktoberfest. Additionally, you can purchase limited edition Giclee prints on premium textured watercolor archival paper for $75. The prints will be signed and numbered by the artist. Please consider putting in a bid to win this fantastic piece, or purchase a print to frame yourself.